The new Compuware office in Waltham, Mass. was among the most compelling submissions for our 2014 Work Design NOW series, sponsored by Haworth. The top three — announced here — will be profiled in depth in the coming months, but we also want to show off the finalists in short project profiles like the one that follows. Stay tuned for more! The reception desk at Compuware’s new Waltham, Mass. office, designed by CBT Architects. All photos by Anton Grassl, courtesy of Compuware. On January 1 of this year, the Boston branch of the tech company Compuware moved into its newly renovated 70,000 SF offices. The renovation, completed in partnership with CBT Architects, came after Compuware’s acquisition of two local software companies. With an eye to seamlessly integrating these three companies, the renovation focused on building a sense of collaboration, community, and flexibility. After looking at plans for six potential office spaces, Compuware selected the current single floor office in Waltham, Mass. because it could bring all 350 employees together in one place. “The single floor layout facilitates maximum collaboration, interaction, and ease of communication between teams,” said John Van Siclen, general manager of Compuware’s APM Business Unit. A wide, central “boulevard” extends from the reception area through the café, connecting various program areas throughout the office. The office features a central boulevard which extends from the reception area through the café, Network Operations Center (NOC), meeting rooms, work stations, and employee entrance. This boulevard acts as a kind of “Main Street”, with access to a majority of the program areas throughout the office. 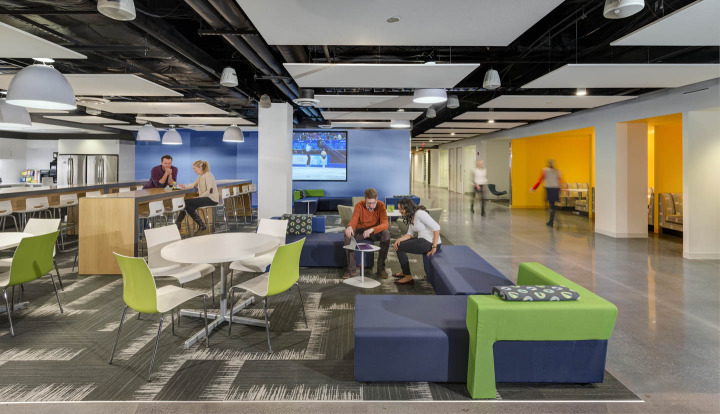 Compuware’s new office also emphasizes flexibility, and the single floor plan means that every inch of the space was utilized. The design team made the decision to reuse the pre-existing training and server rooms, saving time and contributing to the project’s under-budget completion. Mobile seating, touchdown spaces, and lounges are interspersed throughout the office to facilitate impromptu meetings and casual interaction. Photo by Anton Grassl. To further maximize use of the space, the team chose to use “a limited, but flexible furniture kit of parts,” which included a one-size workstation and a standard office set-up. Mobile seating and lounges were also placed throughout the space to facilitate impromptu collaboration and more informal meetings. Additionally, touchdown spaces interspersed throughout the office and huddle spaces located in the workstation quadrants serve to further encourage impromptu collaboration. To further maximize use of the space, the team chose to use “a limited, but flexible furniture kit of parts,” which included the soft seating in the huddle areas, as well as a one-size workstation and a standard office set-up. Photo by Anton Grassl. This efficient, vibrant new office in Waltham is filled with natural light and reflects the vibrancy and dedication of its employees. Who Doesn’t Love a Living Wall? A genius public-private partnership at the University of Washington.